In 1964, Pat MacCleary and several other Worthington Historical Society (WHS) volunteers started a program for third-grade students in the community. This year the program, which is now called Pioneer Days, celebrates its 50th year and hosts more than 1,000 area students during the month of May. 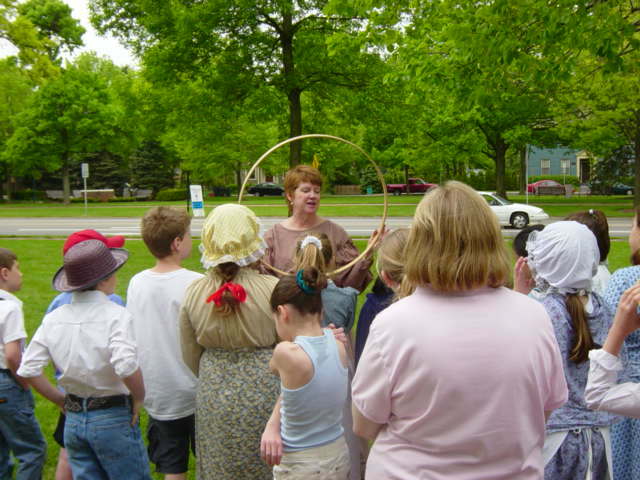 The program will host 13 elementary schools and bring Worthington's history to life for another generation. Before the Field Trip: A WHS volunteer visits each school with a basket of items commonly used by families during the pioneer days of Worthington. The items are part of the WHS educational collection, and students may handle them—unlike other items they will see on display during their trip to the Orange Johnson House. On the Day of the Field Trip: Children are encouraged to come in costume to enhance the experience of life as a child in the early 1800s. They will visit St. John's Episcopal Church and cemetery, the Orange Johnson House and the Village Green. Volunteers will share a brief history of St. John's Episcopal Church, an institution that played an integral role in Worthington's establishment. In the cemetery, the kids will make grave-rubbings. And back at the Orange Johnson House, they will participate in an age-appropriate tour of the museum. Finally, everyone will head over to the Village Green to participate in Pioneer Games like rolling hoops and ring-on-a-string. For more information about Orange Johnson House activities, Pioneer Days, or the Worthington Historical Society, visit worthingtonhistory.org, email info@worthingtonhistory.org, or call 614.885.1247. For updates about Worthington events and places of interest, go to visitworthingtonohio.com. Get the latest updates on Facebook: Visit Worthington Ohio.